There are a million bread and baguette recipes out there and I was looking for one that worked in my electric oven in the 78°F of a/c Florida life. I know what a baguette tastes like and how it is made in Europe, and I wanted it here. This recipe has thirty minutes of ‘hands on’ time over a five and a half hour timeframe. “Easy’ is prevalent in our recipes as thirty minutes is unacceptable for most of us. "Easy" recipes are rarely acceptable. In my world, this is easy and much less expensive than a weekly ticket to France. Click HERE for King Arthur Flour professional video link for the ‘easy’ shaping techniques to make the bread great. *Use ~1 oz less in a humid environment, ~1 oz more in a dry climate, or somewhere in between. 1. Make the poolish by mixing the yeast with the water, then mixing in the flour to make a soft dough. Cover and let rest at room temperature for about 14 hours, or overnight. 2. Mix active dry yeast with the water, then combine with the poolish, flour, and salt. Mix and knead everything together at a lowest speed to incorporate the ingredients (and make adjustments) until you've made a soft, somewhat shaggy dough - it should be cohesive, but the surface may still be a bit rough. 3. Cover and let dough rest for 30 minutes. 4. Knead for about 5 minutes on speed 2 of a stand mixer. The dough should then be smooth and elastic showing good gluten development. 5. Place the dough in a medium-size lightly olive-oiled bowl, cover, and let the dough rise for 3 hours, gently deflating it and turning it over after 1 hour, and then again after 2 hours. The deflating and turning can be done on a lightly floured work surface - the final one should be - stretching it and folding all four sides, tamping gently to degas. 6. Divide it into three equal pieces. Pre-shape each piece into a rough, slightly flattened oval. To shape, slap/pat gently with the heel of the hand to degas and then pull and fold top 1/2 over, then pull and fold top corners, then small folds from the top with fingers curled over the top edge and the thumb and palms pushing/oscillating forward on the work surface until it forms a smooth and soft long oval. 7. Cover with towel/plastic wrap or greased plastic wrap, and let them relax for 20 to 30 minutes. 8. With the seams up (ends right to left), pat out the gas, flattening. Fold top 1/3 over and press in with fingers removing more gas, turn 180° and repeat. Start at one end working to the other end and fold top third+ over and down with one hand (fingers wrap over and thumb buries in), pat/press the dough with heal of other hand to meld and degas, fold & press, fold & press... Repeat, but take fold and seam all the way over to the surface edge. 9. With the seam-side down, cup your hands and very gently roll the dough into a 16" to 24" log. Finger tips and base of hand stay in contact with work surface when rolling. Start in middle and roll back and forth out to the ends. Place the logs seam-side up onto a lightly olive-oiled or parchment-lined sheet pan. 10. Cover them with a floured towel/plastic wrap or lightly greased plastic wrap, and allow the loaves to rise till they've become puffy, about 1 to 1 1/2 hours depending on room environment. 11. Preheat oven to 435°F to 450°F. 12. 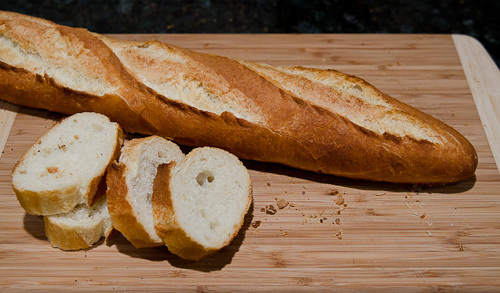 Using a bread lame or sharp knife, make 3 to 5 angled slashes in each baguette. Mist the baguettes heavily with warm water to help them develop a crisp crust. 13. Bake the baguettes until they're a very deep golden brown, 25 to 30+ minutes. Remove them from the oven and cool on a rack. Optimum time and temperature varies with different ovens.